Whether you are fighting overseas, or supporting those that do, then you may want a Battle Saint in your corner. "It's got all the saints that protect you," said Cynthia LeMay as she handed a World War II veteran a Battle Saint bracelet at the Intrepid Air and Space Museum. “We have seven of our immediate family members in service right now and two are deployed,” said LeMay to another Veteran who responded: “Yeah I know what that's like." The Battle Saints make up a new awareness bracelet developed by LeMay , a military mom. She got the idea from her son Gabe. During a tour in Iraq -- Gabe's chaplain handed out the wooden bracelets and simply said: "take this bracelet." From his mouth to her ears. "When you have a loved one over there not a moment goes by where you don't worry about them," said LeMay. Depending on their size, the bracelets have a dozen to sixteen different saints with battlefield connections. "Saint Joseph of Cupertino, for example, was known to levitate so he protects aviators and people who fly," said LeMay. 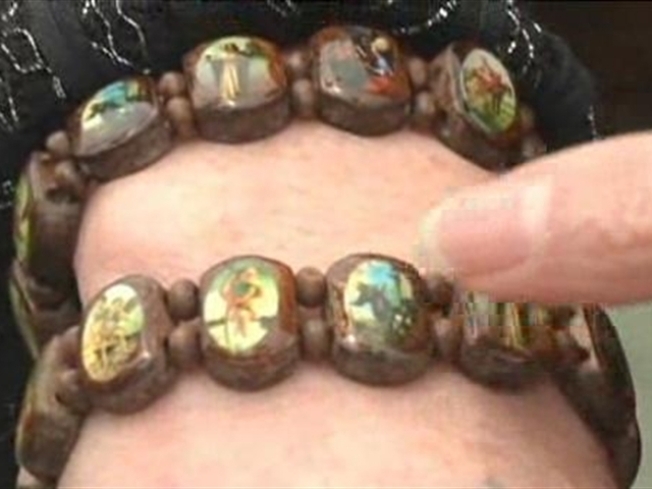 But even though the bracelets are covered with Catholic saints, the bracelets themselves are non-denominational. "These are meant to represent all aspects of the military provide protection for all folks that are over serving," said LeMay. During Fleet week LeMay and her daughter are handing out the bracelets for free, but they can also be purchased online for $5. The profits go to the Intrepid Fallen Heroes Fund. And the bracelets are attracting fans from the tiniest of patriots to the greatest generation. “We helped you out and now you're helping us out and that's terrific,” said World War II Veteran Edwin Breidenbach who embraced LeMay after she explained the significance of the bracelet. “Keep the boys in the service up and well."